London: The 175 turbine London Array project, the world’s largest offshore wind farm, jointly owned by Dong Energy, Masdar and EON, which started gradual production of green energy to reach full capacity of 630MW since last October, was officially inaugurated by David Cameron, British Prime Minister, and Shaikh Abdullah Bin Zayed Al Nahyan, Minister of foreign affairs. Cameron commended the efforts In the field of clean energy, saying that the UK had turned out to be a hub for foreign investments in renewable energy. “The FDI in whole countries of the EU had declined by 40 per cent last year and in the UK it increased by 40 per cent. This is a sign of the very great investment and economic opportunities the UK harbours,” said the prime minister. He added that the London Array will help supply about half a million houses with power. “The project, the biggest offshore plant for power, is a great win for the UK. It demonstrates the great confidence in the UK economy and reflects that the UK is a fantastic investment market for renewable energy,” said Cameron. Shaikh Abdullah said that both countries enjoy very strong historic ties. “The UAE has very good experience in energy fields. We also have very good reserves of hydrocarbon reserves which has prompted us to seek energy security by diversifying our energy mix in order to sustain our economic and social development purposes,” said Shaikh Abdullah. ties between the UK and the UAE. “The plant is a landmark and it will boost future investments further. The project will help transform energy supply in the UK,” remarked Jeremy. “With 175 gigantic wind turbines, the plant is now exporting power to about 500,000 homes annually through the national grid. The total height to blade tip is 147 metres, higher than the Eye of London which is 135 metres. The rotor diameter is 120 metre,” said Richard Rigg, project director of London Array Limited Construction. Rigg pointed out that turbine installation was completed in December 2012. Since then the project has focused on fully commissioning and putting into operation all 175 of the 3.6MW Siemens turbines by May 2013. “This is a milestone construction. Construction on the onshore substation at Cleve Hill started in July 2009 and was completed in October 2012, while offshore construction started in March 2011, with a cost of €2.2 billion(Dh10.48 billion),” added Rigg. Sultan Al Jaber, minister of state and CEO of Masdar, told Gulf News that London Array has become reality after overcoming land and sea challenges on both land and at sea. “Masdar is a major partner of some of the world’s most sophisticated and large-scale renewable energy plants as we believe the value of robust collaborative efforts. 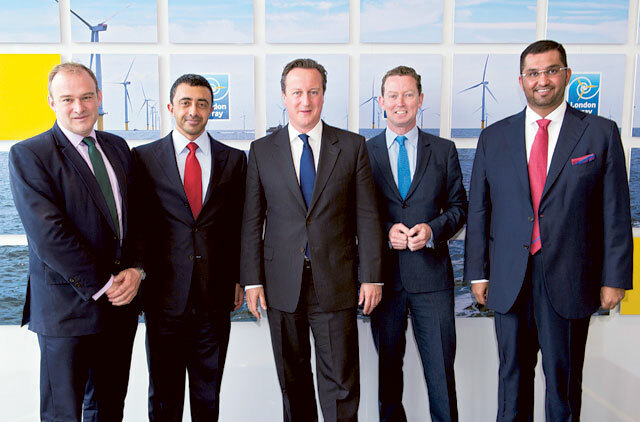 We are proud to contribute to the clean energy mix in the UK and will be committed to growing offshore wind capacity in the UK and worldwide,” said Al Jaber. He added that this is a true testament of investments in renewable energy projects. “This is a great revolution which is based on partnerships and collaboration. We are eying projects in eastern parts of Asia, America, the Middle East and North Africa (Mena) and the European Union. We build on our accumulated experiences in renewable energy and see knew investments,” said Al Jaber. He added that Masdar had become a landmark in renewable energy at international arenas. “Our investment in London Array is purely commercial while our investments in some places such as Mauritania and Seychelles are for purposes of development and based on effecting social economic and development changes to improve the lives of residents of these countries,” he explained. Rigg said that the environment-friendly project will help reduce harmful CO2 emissions by almost one million tonnes per year. “This plant will make a big difference to the environment as well as help to provide a reliable electricity supply to south east England,” stressed Rigg. London Array, which has been constructed about 20 kilometres off the coasts of Kent and Essex on a 100 square kilometre area, is a consortium with DONG Energy which has 50 per cent, E.ON has 30 per cent and Masdar has a 20 per cent stake. A possible second phase could be possible in the future as studies are underway to help reach 1000GW capacity. “We have submitted a plan and are currently conducting studies in this regard. The final say is at the court of the concerned authorities,” said Matt Pritton, commercial manager at London Array.